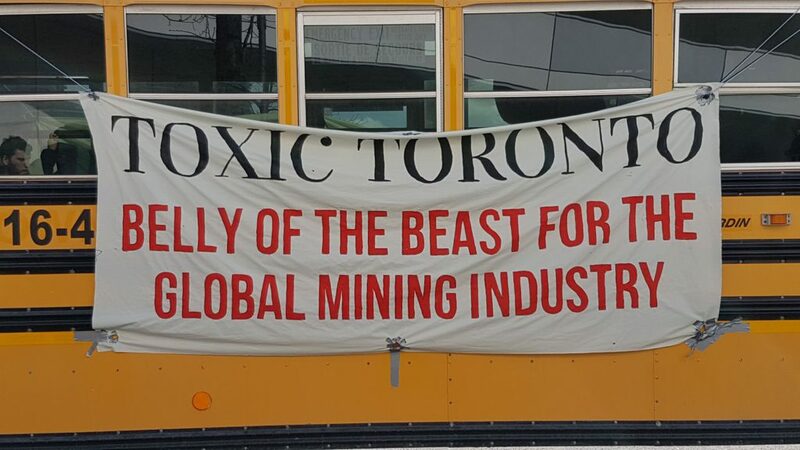 Canadian mining companies are often at the forefront of global mining operations, with some 60% of mining companies in the world listed on Canadian stock exchanges and involvement of Canadian firms in an estimated 32% of reported mining conflicts. Latin America and the Caribbean are the principal destinations for Canadian mining investment beyond Canada’s own borders, and mining is the single activity for which Latin America and the Caribbean are the most important destination for Canadian overseas direct investment. 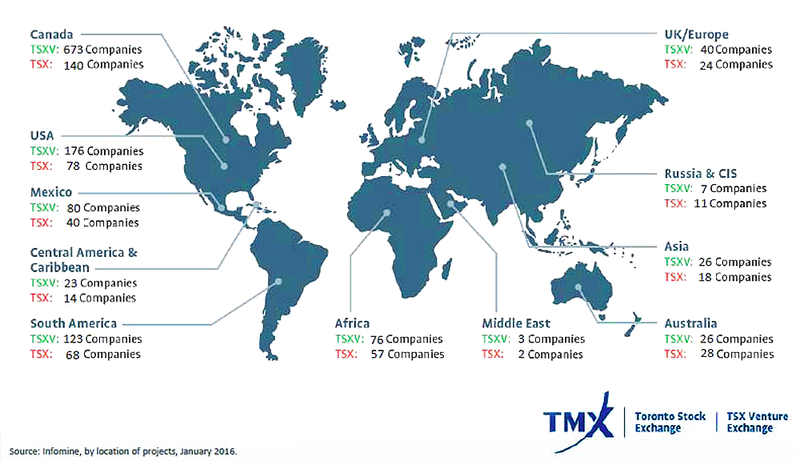 This map from the TMX Group’s Mining Presentation illustrates where the 1,318 Toronto Stock Exchange (TSX) listed companies are invested in mining projects around the world as of January 2016. Mining companies listed on the TSX and TSX Venture Exchange have 6,307 projects, over half of which are in Canada. Another 18% are in Latin America, the principal region in which TSX-listed companies invest abroad. ▷ Access to capital. Mining companies are easily able to list on Canadian stock exchanges, which have lax rules compared to listing requirements in the US. For example, companies are permitted to publicly promote mineral discoveries before they are well defined, which promotes speculation and gives incentives to exploration firms in particular. ▷ Low taxes. Canada has the lowest corporate tax rate in the G7 and specific tax incentives for mineral exploration in Canada. ▷ Weak measures for environmental and health protection in Canada, as well as colonial policies of dispossession that have opened up Indigenous territories for natural resource extraction. ▷ Economic diplomacy, aka state promotion of mining through lobbying both in Canada and abroad. The Canadian government routinely uses its influence to push for laws and policies in other countries that are favourable to the Canadian resource extraction industry. Example: The Canadian International Resource Development Institute (CIRDI) acts to influence policies and laws in natural resource sectors in other countries. CIRDI is funded by Global Affairs Canada (formerly the Department of Foreign Affairs, Trade and Development). It operates with government and industry oversight and has established links with three major universities in Canada. ▷ Tied aid uses overseas development aid with strings attached to influence natural resource management in foreign countries and promote extractive industry expansion, often through partnerships between NGOs and mining companies. ▷ Investor protection agreements with other countries give transnational companies favourable conditions for investment and recourse to sue states when they or their courts make decisions that companies find unfavourable. In practice, this means governments can be open to liability for enacting laws and regulations designed to protect the environment, labour or human rights, if such policies interfere with the activities and profits of foreign corporations covered by investor protection agreements. ▷ Concentration of sector-specific services in cities like Toronto and Vancouver (e.g. legal services, analysts, stockbrokers) make these centres favourable environments for the resource extraction industry. ▷ Legal impunity: the Canadian government keeps mechanisms for lodging complaints against Canadian companies deliberately weak. Such mechanisms often do not result in proper investigation of complaints of human rights abuses, nor do they make determinations about whether or not companies are actually following the voluntary guidelines that the Canadian government purports to promote. So far, the result has been that Canadian companies bear little risk of being held accountable or of being sued in Canadian courts. ▷ Tolerance of repression and violence in mineral rich areas. 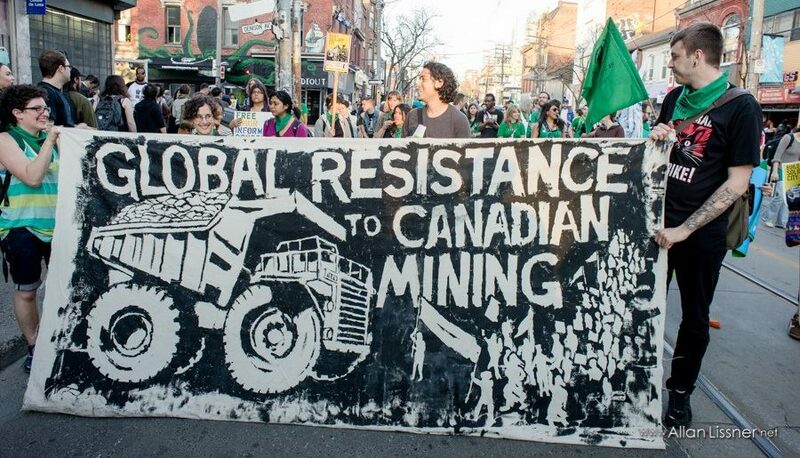 In addition to keeping legal accountability mechanisms weak and in favour of Canadian mining companies, the Canadian government consistently turns a blind eye to violence and repression of dissent in the context of opposition to resource extraction activities by affected communities. For more detailed examples of how the Canadian government uses it’s influence at home and abroad to further the interests of Canadian mining companies, see our Country Cases. Such advocacy on behalf of corporate interests frequently comes at the expense of of human rights, Indigenous sovereignty, the environment and the well-being of mining-affected communities. Varios miembrxs de la Coordinación General de la OFRANEH, hemos sido criminalizadxs, judicializadxs y amenazas a muerte, Geovany Bernardez, Malvin Lopez, Kerlin Colón, Nahun Lalin, Carolina Castillo, Carmen Alvarez y mas, así que no me digan que no es política de Estado jodernos.